DON’T THINK ABOUT THE WRINKLES JUST IRON THEM. If you open the package of this DIY Christmas tree you can see that the felt is folded with some wrinkles. No problem. 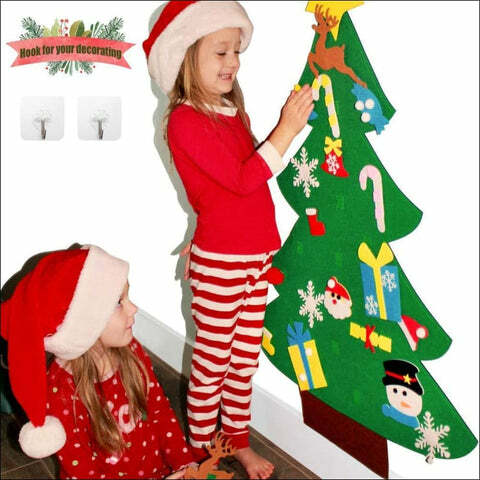 You can easily solve the issue, just iron the Christmas felt tree and the tree will be flat and beautiful again for holiday decorations. YOU WILL ALSO GET A 2-YEAR WARRANTY AND A HEAVY DUTY HOOK FREE. We should be responsible for any problems that arise with the little wall Christmas tree during two years. Everything you will need to do is just cleaning the surface with rubbing alcohol. Press hook firmly to ceramic, glass, stainless steel surface or door (except for painted wall) from the center outward to get rid of any bubbles. Now, let’s decorate our xmas trees and adore its beauty.